Sounds In Silence is a label that releases well produced, hand made albums with a certain dignity and delicacy that makes both the artists and itself stand out in the whole Indie/Underground/whatever field of music. Caught In The Wake Forever is a project by multi-instrumentalist Fraser McGowan, whose gentle creation draws a fine line that connects brittle melodies of nostalgia, and more experimental breathing, far into the realms of the abstract. The hazy picture on the cover already creates the settings for the story of ‘False Haven’ which unfolds as a gentle and melancholic dusk-gazing dream. Personally, my favorite parts in this album are the more abstract tracks, that sound like a needle-thin vibrating dissection of the gentle melodies that McGowan plays elsewhere in the album. In other words, it seems like the more melodic part of this great album paints a picture of a dream, while the more experimental part dreams about this dream, losing the shape and gaining the catharsis. So far I have heard several releases by Sounds in Silence, and it seems like this label has a solid agenda both in music and in the artwork and packaging. 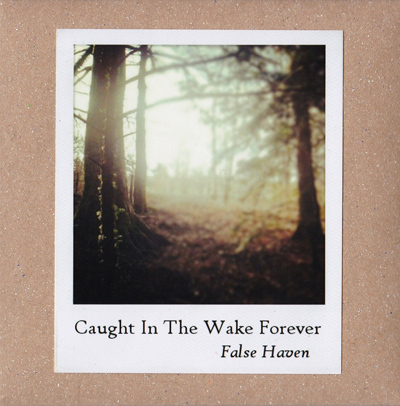 ‘Caught in the Wake Forever’ not only stands as a fine release in the label’s roster, but in my opinion this is also the best album I have heard so far from it. Limited to 200 copies, I suggest you get your own soon.